The Associated Builders and Owners of Greater New York (ABO) helped raised $185,000 for youths with disabilities through its sponsorship and participation in the 13th Annual Bill Gallo Sports Awards Dinner at the Marriott Marquis Hotel. The money raised will assist in sending 300 boy and girl scouts to camp in a suburban setting. For the past 13 years, ABO has helped raise over $1.375 million for the Learning for Life Division of the Boy Scouts of America. This year's gala event was chaired by ABO president Jerome Belson who was joined by vice chairs: Elaine Eisner, director of ABO; Rudy Riska, executive director of the Heisman Trophy; Gina Bertucci, director of catering at the Marriott Marquis Hotel; Dave Davis, president and general manager of ABC-TV; Chris Monasch, director of athletics of St. John's University; Brandon Steiner, chief executive officer of Steiner Sports Marketing and John Campi, vice president of Community Affairs & Promotions. The event featured a special roast to honoree Bill Gallo, a nationally famed sports cartoonist for the N.Y. Daily News. 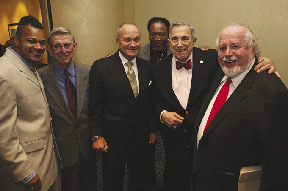 He was roasted by: Joe Stella, vice president of Entertainment and Travel for the N.Y. Daily News; Joe Frazier, former heavyweight champion of the world; Bert Sugar, Boxing historian; Warner Wolf, sportscaster and radio personality; Lou Duva, boxing trainer; Pat Cooper, comedian and Jerome Belson, president of ABO. Also in attendance were some of the finest Metro New Yorkers: Ray Kelly, commissioner of the New York City Police Department; Dave Shakespeare, former chairman of the Heisman Memorial Trophy Committee and U.S. Marines; Jim Sfayer, a New York Colonel; Scott Clark, WABC-TV sports anchor; Lou Carnesecca, St. John's University Hall of Fame coach; Paul Goncalves and Nelida Cardiello, directors of Learning for Life. Other attendees at the dinner included several Learning for Life students who presented Bill Gallo with an award and drawings, recited the Pledge of Allegiance and the Learning for Life pledge. A color guard presentation of the American flag was also made. The Learning for Life division of the Boy Scouts of America, which benefits over 32,000 youths with disabilities, across the five boroughs in New York City, provides an opportunity to participate in leadership roles, camp experiences and is adapted to the needs and capabilities of youngsters with disabilities. Event chairman Jerome Belson said, "Once again the real estate industry steps to the forefront and helps those greatest in need. This is truly an industry with a heart."